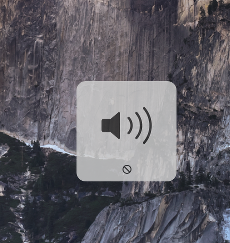 When I plug my headphones into my MacBook Pro or when I return to my MacBook Pro after the headphones have been plugged in for a while, sometimes I get no sound, the Sound icon in the Menu bar is greyed out and when I click the Sound up button on the keyboard I get the below icon (see screenshot). If I take the headphones out and wait a couple of seconds then replug them in they work again. Headphone wise I've seen this happen with a range of headphones from Apple EarPods to Bose noise canceling headphones. I've seen this happen on two Mid 2012 MacBook Pro models, a 15" and 13", both running OS X 10.10. Any ideas what's causing this and how I can be resolved? Just in case any one mentions it, I'm plugging the headphones into the 3.5 mm headphone jack not the cinema audio port. The next time it happens please option-click (hold 'option' while clicking) on the volume icon in the menu bar. There you should see all available sound cards and headphones. Please let us know what entries you can see. I get to very same response if I plug in a USB mixer. Not the answer you're looking for? Browse other questions tagged iphone macbook audio headphones . Why do Chinese EarPods not work with German MacBook Pro?